Do You Know The Best Back-to-School Secret? Do You Know the Best Back-to-School Secret??? and plan decent snacks and lunches. I’ve found as my kids get older that I have less and less of a part to play in the back-to-school preparations, especially for those technically adults-but-still-kids going to college. I’d love to think (both as a Mom and as a nutritionist), that the college kids will take advantage of the fresh fruits and salad bars, grilled chicken and fish and other wholesome foods that the food service plans offer for kids living in the dorms. And for the one living in an apartment, of course I pretend that she loads her shopping cart at the grocery store with fresh, whole foods and makes balanced meals every chance she gets. And for all of my children, I can try to imagine that they are getting enough sleep, exercise, vitamins, minerals, good fats, plant compounds, etc. and taking supplements to make the up the difference. But I don’t have to tell you what the reality is: school is hard work and students’ lives, especially as they get into high school and college, are some of the most unbalanced lives in existence! The only thing I can – and do – insist upon is that they take daily probiotics. Because having their GI (gastrointestinal) tracts in the best shape NOW means they will be better able to handle the stresses they will shortly experience. That’s the back-to-school secret. Why So Important for Back-to-School? Back-to-school is a stressful time and people’s immune systems get bombarded with germs they haven’t encountered before, but the stress makes it harder to balance the fight against those germs. Did you ever notice that within a month to 6 weeks of being at school, most kids are sick with colds and sickness spreads like wildfire ? What Does Research Show About Probiotics and Colds/Flu? For comparison purposes, I’m only citing 2 of several studies that were done. In one, a 2012 double-blind placebo-controlled study of 198 college students living on-campus in residence halls was conducted in which about each half received a placebo powder or a minimum of 1 billion cfu/day of probiotics of each strain of Bifidobacterium animalis subsp lactis BB-12 and Lactobacillus rhamnosus GG for 12 weeks. Had a higher quality of life that resulted in less school days missed (15 vs. 34). Why did this happen? Researchers speculate that since cold symptoms are actually your body’s inflammatory response to the cold virus, probiotics may dampen that over-exaggerated inflammatory response. Thus, less misery. But there’s more to it than that. Looking at this from a broader perspective, 2 billion cfu/d for an adult for less than 3 months really may not be a lot of probiotics for immune modulation. But another study looking at cold and flu-like symptoms, this time in 326 children 3-5 years of age, was conducted in which the children received 10 billion cfu/d of either Lactobacillus acidophilus NCFM (110 kids) or L. acidophilus NCFM + Bifidobacterium animalis subsp. lactis Bi-07 at a 50/50 ratio (112 kids) or placebo (104 kids) for 6 months starting in the month of November. Duration of symptoms decreased from 6.5-7.3 days for placebo to 4.5-4.7 days for NCFM and 3.4-3.7 days with NCFM/Bi-07. So the combination probiotic cut the days of misery (for both parents and kids!) in half, and only 31% of these kids had cold symptoms at all compared to about 82% of the kids taking placebos. You can see that 10 billion cfu/d in a 3-5 year-old for 6 months is a lot longer and a lot more concentrated than 2 billion cfu/d in an 18-25 year-old for about 2.75 months. The results are more striking, too. Is that a coincidence? Or is that part of the Back-to-School Secret? What do YOU think? 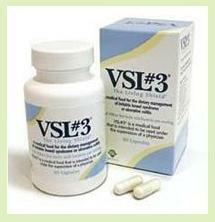 VSL3 probiotics supplement is a high-potency probiotic supplement medical food including 8 strains that is intended for the dietary management of the IBD (inflammatory bowel disease) ulcerative colitis, of an ileal pouch and of IBS (irritable bowel syndrome). Thanks to Catarina and Missy for the suggestions for these pages. Do YOU have a suggestion? For those of you who are familiar with VSL3 probiotics supplement, there is a new junior version with ‘only’ 225 billion cfu per sachet (still very potent compared to other probiotic supplements). I had the opportunity to listen to an enlightening phone interview with Czerral Wheeler, D.V. Med, MMBM. He commented on pet foods and the need for pets, as well as their owners, to have probiotics and to eat species-appropriate foods. He created a powdered certified organic probiotic powder called “InLiven” (for both humans and pets) which contains 11 Lactobacillus species, B. bifidum, Bacillus coagulans, S. boulardii and S. cerevisiae grown on 26 raw, organic whole foods for 3 weeks prior to bottling. Each 1 tsp serving contains between 20-40 million cfu. Note that some of those whole foods, such as wheat, barley and malt extract contain gluten. As a bonus for listening to the call, I received a promo code for a discount for InLiven that I want to share with you. This link will take you to The Olive Parent’s website promotions for Miessence InLiven for which I receive NO compensation for any purchases. You can receive a single jar of InLiven for 20% off with promo code: petinliven (lowercase) The link to a single jar is here. If you really like InLiven, there is a Lifestyle Member Discount. With an initial purchase of $150.00 or more, you'll receive 20% off of your order, discounted shipping AND you'll receive 20% off of all future orders for LIFE. The link to the InLiven Value Pack is here. (same website as previous one). The promo code ends September 6th, 2013. I’d love to know what you think. If you found the information helpful, or have comments or questions about it, or ideas you’d like to see addressed, please leave me a message, either by replying to this e-zine, or commenting on one of the webpage links at the beginning of this newsletter, or at Contact Us. Also, feel free to forward this to anyone you think would benefit from it. If you were forwarded this ezine, and you like what you read, you can subscribe to it yourself at Power of Probiotics. PLEASE NOTE: Since I value your permission to be a subscriber, only a few back-issues are saved as previews for new subscribers. The only way to get every newsletter is to subscribe, so thank you!